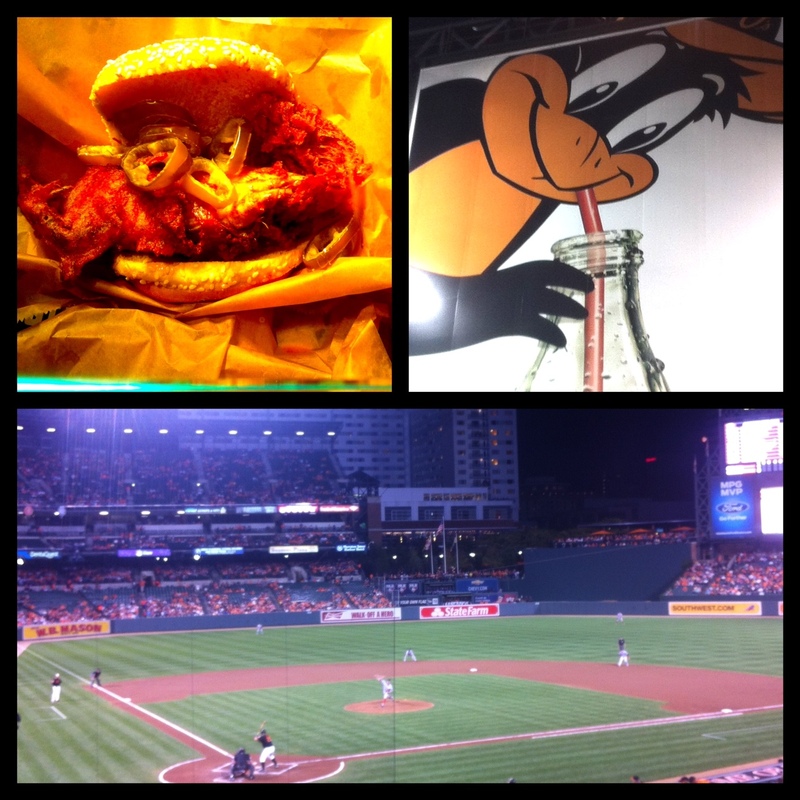 The only experience I had with Orioles baseball before this trip was watching the 161st game of the 2011 season. Boston was so close to making it to the playoffs- every pitch mattered. I watched on TV from Pawtucket with my best baseball buddy Rachel as Ryan hit not one, but two home runs in his first game as a catcher. It was one of the most exciting games of the season. My heart exploded! I’ve never been so genuinely happy as I was that night. I wanted to be there so badly! I think most of Boston felt the same way. And the worst part about it- there were hardly any people in the seats! 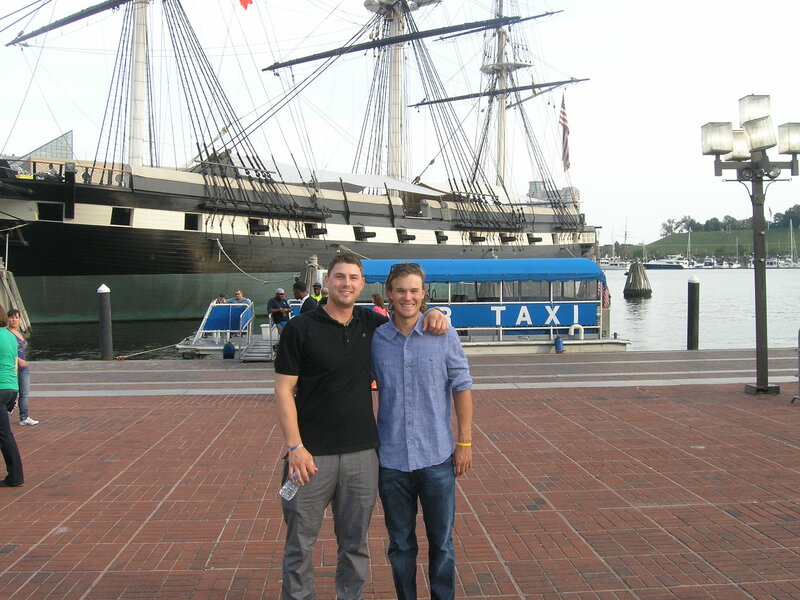 Baltimore was far out of the playoff race and the rare and few fans at the game were mostly from Red Sox Nation. We are so spoiled at Fenway that I forget how lucky we are to have sold out games. I am so happy to say that even though the tides have turned between last season and this season, Camden Yards was packed with fans rooting for their O’s. As our season comes to an end it is still exciting to see a town support their team so avidly. Oriole Park at Camden Yards is a beautiful stadium that was built in 1992. It is incredibly clean, the seats are comfortable, with modern architecture. Upon walking in I was instantly reminded of Fenway because they close Eutaw Street in the same way that Fenway closes Yawkey Way. There are street vendors and food that are a nice escape from the noise of the crowd. About that crowd… man on man were they pumped and ready for game time. I know I haven’t been to that many games where playoffs were on the line, but it was crazy! They play by far the best music of any stadium and it really keeps the crowd going throughout the game. “Thank God I’m A Country Boy” plays every game during the 7th inning stretch. I love that song. It reminds me of being from Denver and is such a crowd pleaser. The Orioles mascot and a man with a fiddle get up on first base dugout. Old Bay Seasoning- the famous spice mix can be found at all the condiment stands. It’s also served on homemade potato chips. Old Bay is spicy and savory and makes a great addition to nearly anything. They also have sautéed onions at the stands, which I think is a nice addition to ballpark food. Soft Shell Crab Sandwiches– soft shell crab is seasonal, and for those that don’t know is a crab that’s eaten full on with the soft shell. It’s crunchy and is sort of a funky texture if you’ve never had it before. It’s usually tempura fried and served with coleslaw or on a sandwich. For $15 it is in the price range of other ballpark entrees and worth trying. Feeling like something unhealthy? Go to the Stuggy’s Stand in centerfield. 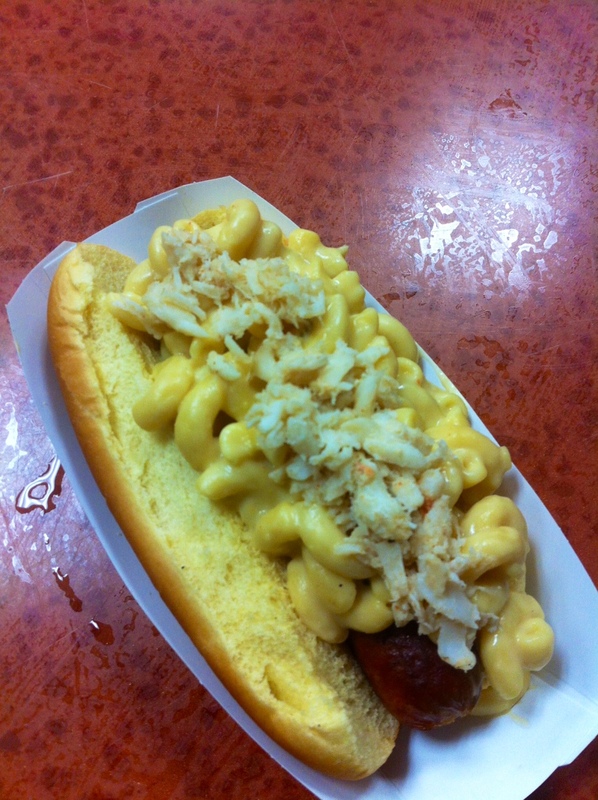 Diana and I ordered the Crab Mac N’ Cheese Hot Dog. O.M.G. It was heavenly. Add some Old Bay on top if you are really feeling the Baltimore spirit. They also serve the Birdland Dog- a hotdog with brisket, tomato jam, and frizzled onions. If you are looking to catch up with friends or have a meal before the game, head to Dempsey’s Brew Pub and Restaurant located on Eutaw Street. They serve beers brewed on site and a full sit down menu. We saw a melted crab and cheese appetizer that looked pretty to-die-for. They are open all year, not just on game days, and are a great alternative to sitting in the park.